The rattlesnake, a uniquely American reptile, was first used as a symbol by Benjamin Franklin, in 1751, in a satirical editorial in the Pennsylvania Gazette. Franklin suggested the colonies thank Britain for sending their convicted criminals to America by sending the British rattlesnakes. 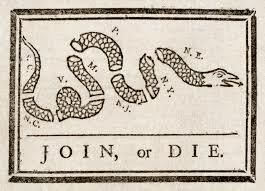 The sectioned snake, representing the 13 colonies, was also seen in Paul Revere’s newspaper, Massachusetts Spy, fighting an English dragon, in 1774. It is, however, another sectioned snake, that offers the most insight into the minds of our forefathers. 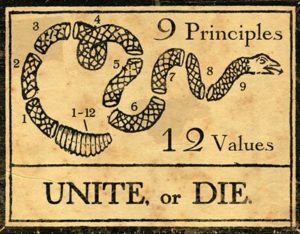 In this instance, the rattles represent the 12 values, and the sections of the snake represent the 9 principles, not the 13 colonies. I have a right to life, liberty, and pursuit of happiness, but there is no guarantee of equal results. This modern day interpretation was brought to us by the radio and television commentator, Glen Beck. Beck reminds us that this flag represents the banner of Conservatism, the same calling our forefathers used to be brave and courageous and continue to fight against the government control, excessive taxation, the safety and wellbeing of their families and the right to work hard and thrive. Those were the very rights described in the Declaration of Independence when this great document stated “life, liberty and the pursuit of happiness“. 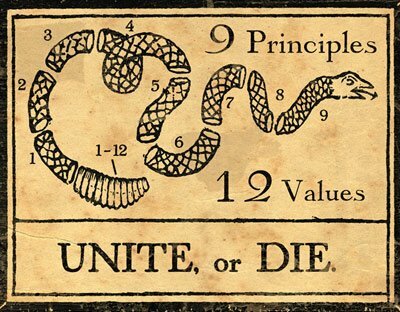 To fully understand how a fledgling group of colonies could defeat, Britain, the most powerful nation on earth, we need only to go back to the document’s title: “The Unanimous Declaration of the Thirteen United States of America.” It was unity and the values and principles stated above that created our great country. We must always remember that the enemies of freedom attack unity first. It is the uncivil discourse and divisiveness created by the “isms” (liberalism, socialism and communism) that all citizens must fear.